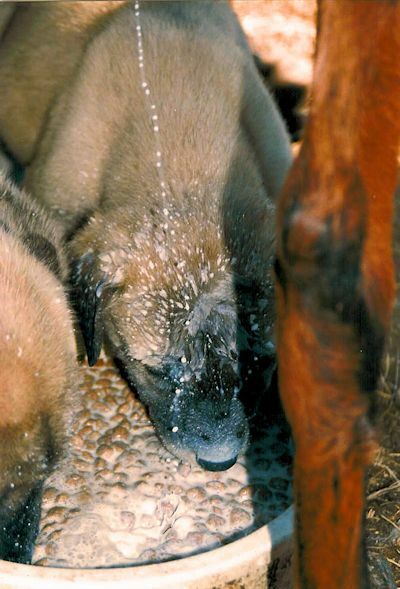 Two Females are Blue Masked Fawns... a very rare Anatolian color. Lucky Hit's Tawny Shadow (Shadow) in winter coat to the right. 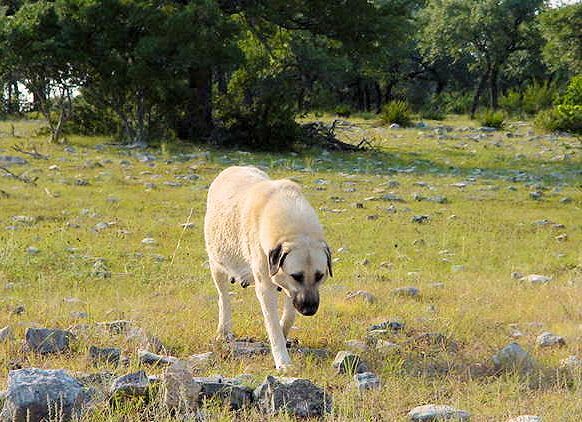 In 2001 I bred Shadow to a wonderful male, Sakarya's Blazing Legend (Duke). 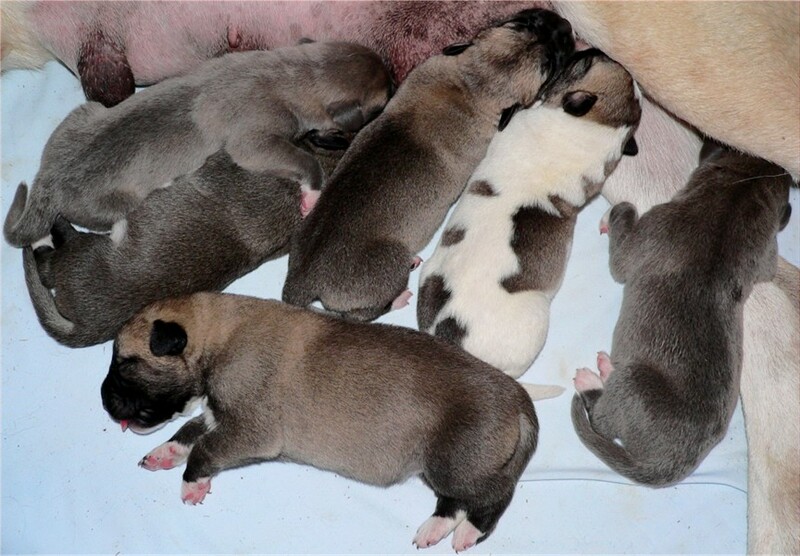 I kept four of the litter of nine pups, three males and a female. 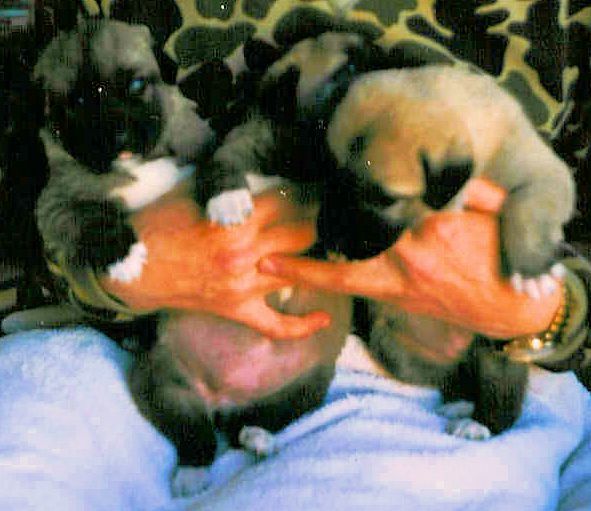 As of July 6, 2002, the female from Shadow's May 8, 2001, litter, Lucky Hit's Seven of Nine (Seven), was ranked 12th in the nation at the Breed Level by AKC. 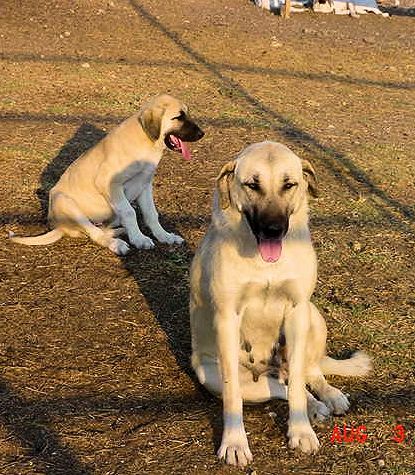 Shadow exhibited many traits I value in a working Anatolian at an early age. 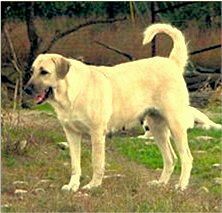 She is the highly valued aloof type Anatolian that I associate with the best working Anatolians. Shadow is incredibly intelligent and makes well thought out independent decisions regarding her working environment. Shadow is fearless in her protection of her charges. 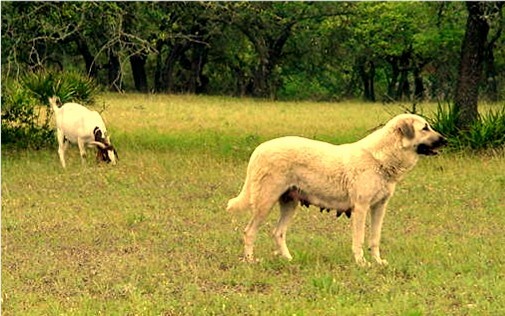 For example, one day I watched Shadow and a male I owned take on a dog pack that had decided to go after my goats. 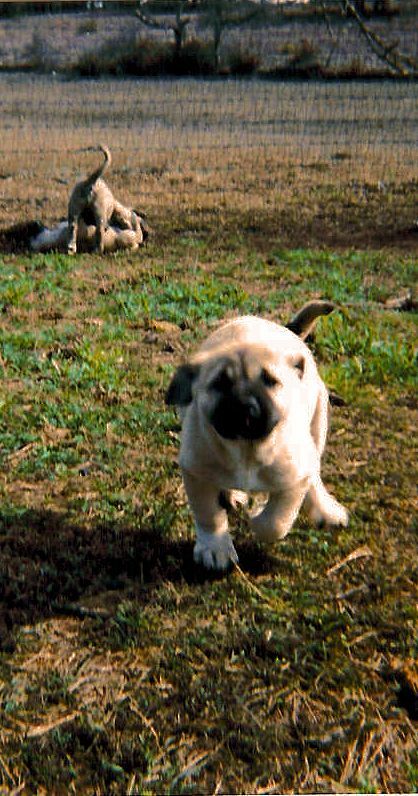 The pack had five dogs, four huskies and a pit bull. Shadow reached the dog pack before the male by first clearing a four foot fence and then clearing a five 1/2 foot fence while running uphill! Without hesitation Shadow picked the most dominant dog and knocked him to the ground with such force that he yelped in pain and surprise and immediately ran away. 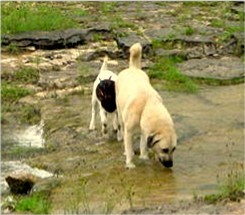 Two of the remaining four dogs disappeared into the woods. Shadow immediately engaged with the nearest dog while my male delt with the last dog. 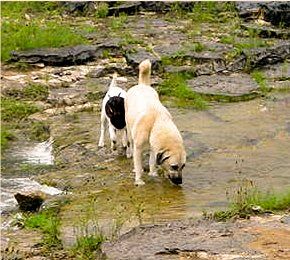 She escorted the unlucky dog away from the property, allowing him to only walk with his head near the ground and his tail tucked between his legs. With all this action she had chased them off without incurring a single mark. 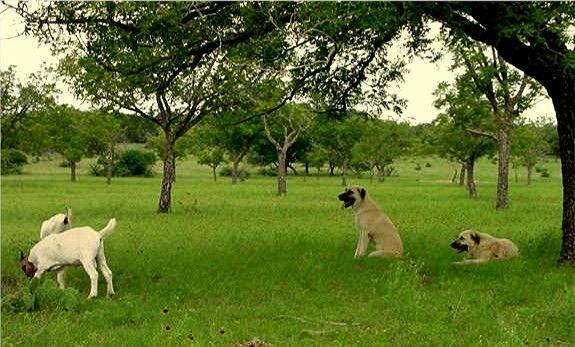 I have never seen those dogs near my property again. 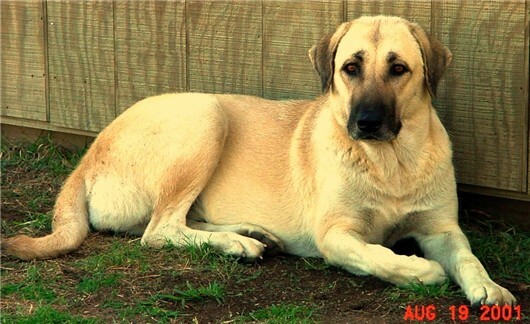 Shadow is a large aloof female with a strong attachment to goats, especially the kids. 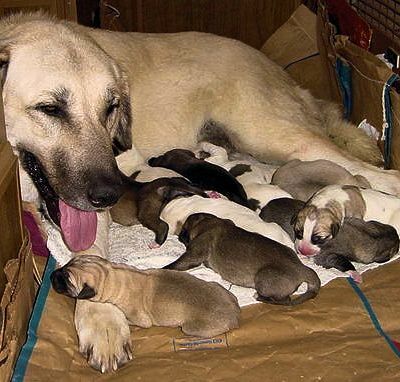 She has excellent mothering ability. Shadow has great internal strength of will, demonstrates a high level of intelligence, and always seems to know exactly what to do. Shadow is the dam of Lucky Hit's Seven of Nine, who is ranked the 12th dog in the nation at the Breed level on July 6, 2002. 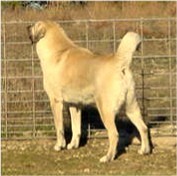 She also produced four AKC CHAMPIONS. 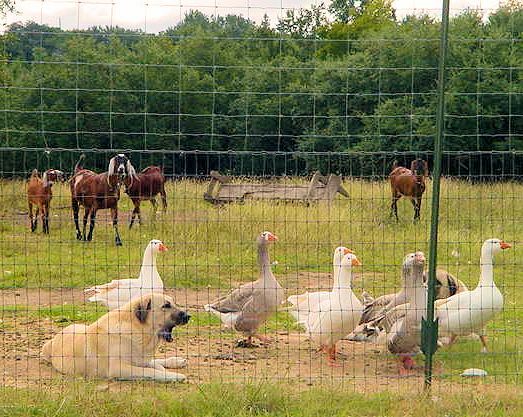 Shadow yawning while guarding geese and goats on October 4, 2004. 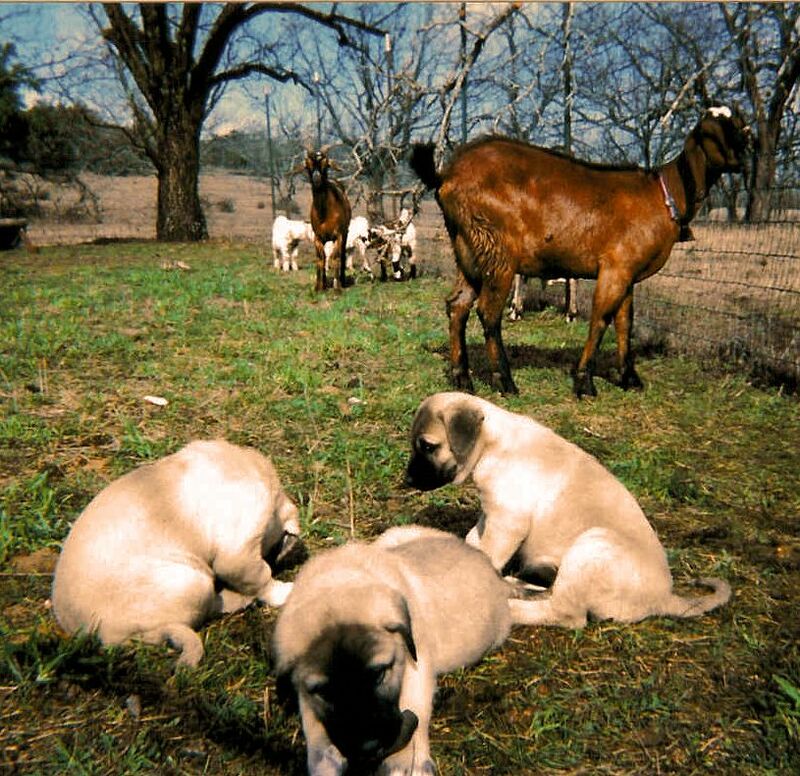 Shadow waiting with goats to be fed on October 22, 2003. 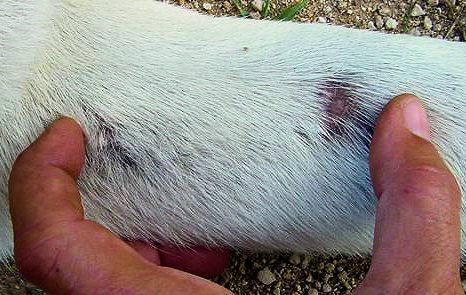 The hairless spots show where its fangs pierced her leg. including Shadow. 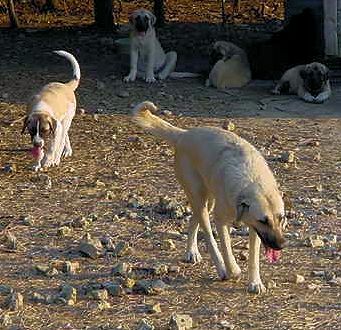 The other four were Case, Tokat, Yahsi, and Seven. 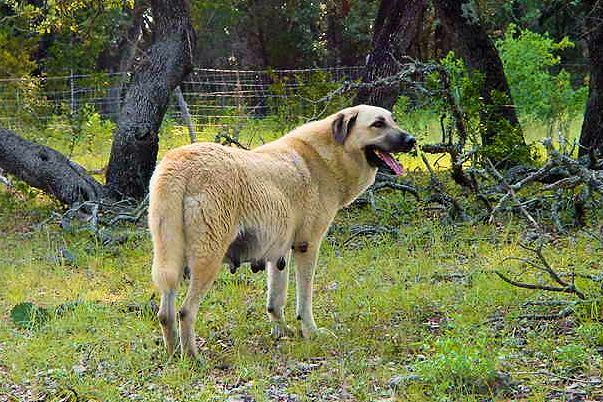 Tokat had a severe injury to his front leg and had his side torn open by three claws. Seven was hit in the rear end and had an injury there. Yahsi and Case were uninjured. neighbor's section pasture. 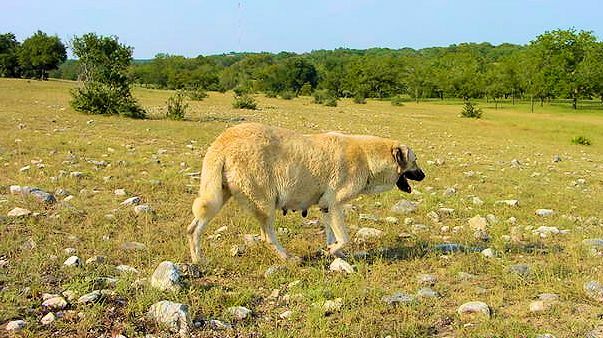 All the Anatolians remained on high alert for weeks afterwards! 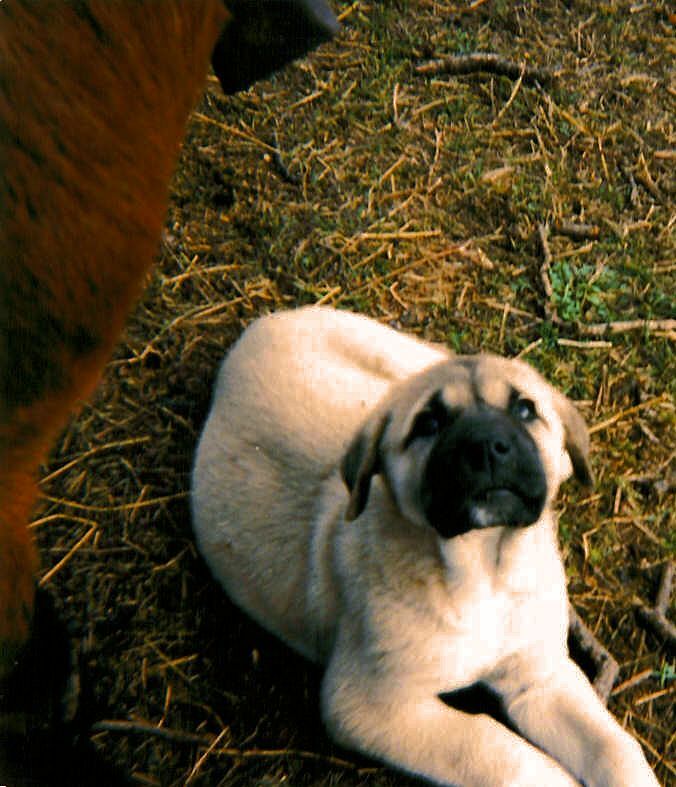 Shadow, lying down, with Yahsi when a pup on July 3, 2003, guarding in the big pasture. 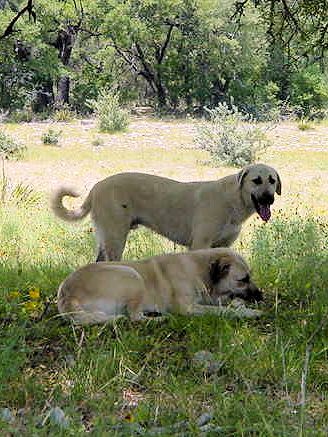 Anatolians in the big pasture. 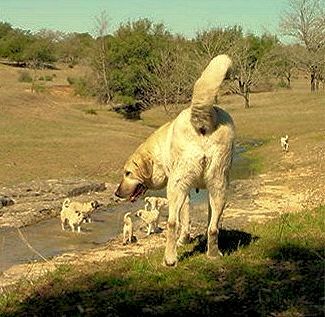 Shadow on March 7, 2003, looking down on her pups playing in the spring in the big pasture. 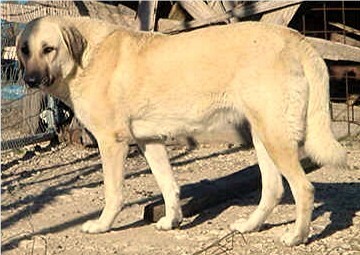 Shadow on August 30, 2002, two days before having 10 pups. She insisted on taking a grand tour around the property! You can see she was quite wet after her swim! 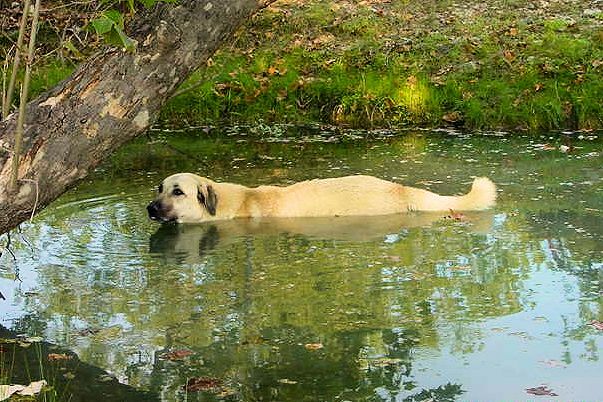 Being so full of pups, she got hot and insisted on a short swim! 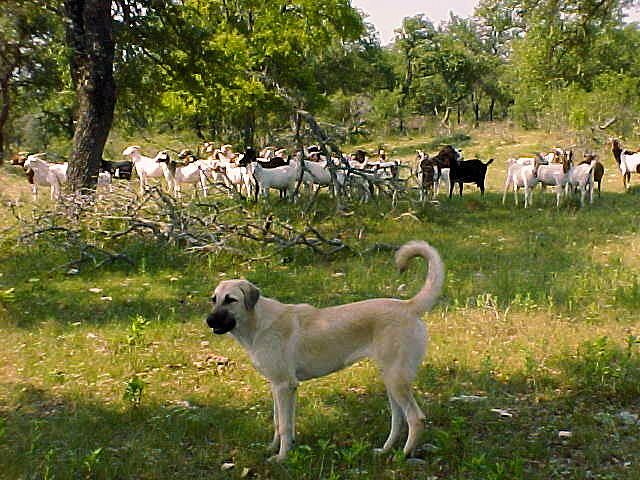 guarding goats in the big pasture. 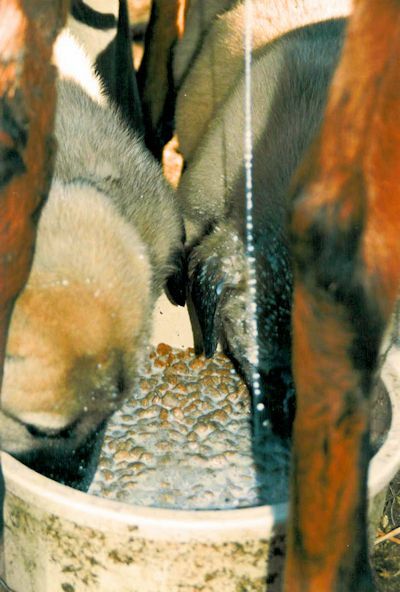 Shadow, pictured above on August 19, 2001.
with four pups from her first litter. The ear posture indicates she is loving toward me and submissive to my will. It's difficult to see, but the back of the ear is held down tightly and twisted forward. 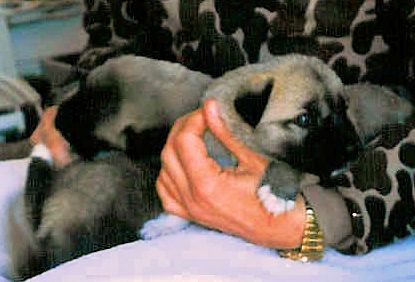 with Kahn, a pup from her first litter. Again notice the ear posture, which indicates she is loving toward me and submissive to my will. Note that the back of the ear is held down tightly and twisted forward. 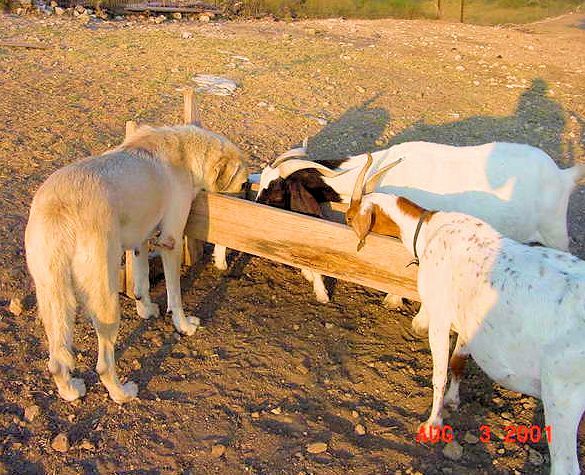 sharing a bite with a couple of her goats. her beautiful topline, and her correctness of substance. 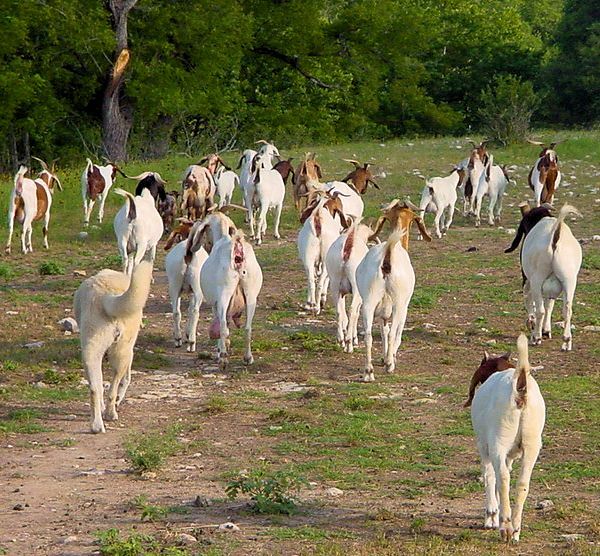 escorting her goats in the big pasture. 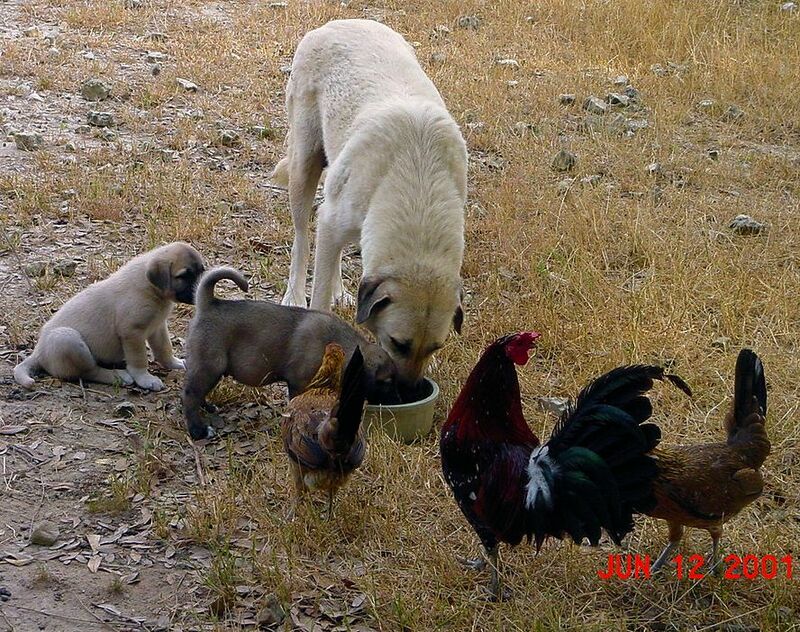 sharing her food with her pups and her chickens. from coyotes, foxes, roaming dog packs, and the occasional mountain lion! Shadow was a very loving pup! 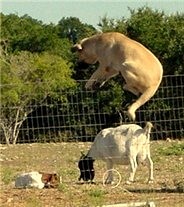 Shadow was always good with the goats and really adored them! 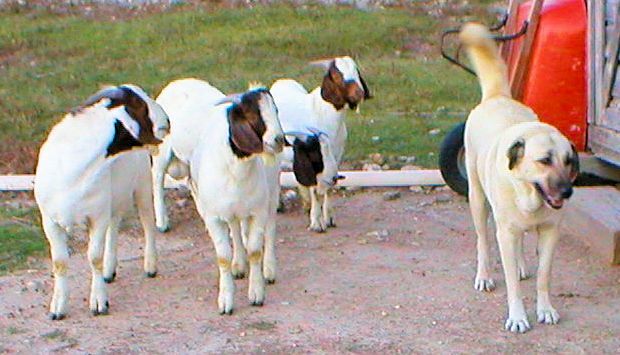 Once shadow was five weeks old, I moved her and the other two pups outside with goats. 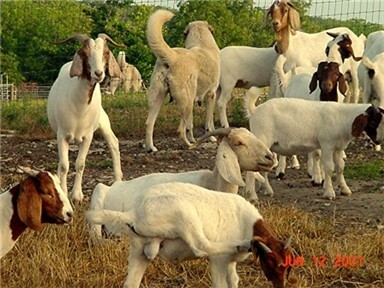 was fed fresh goat milk with every meal! 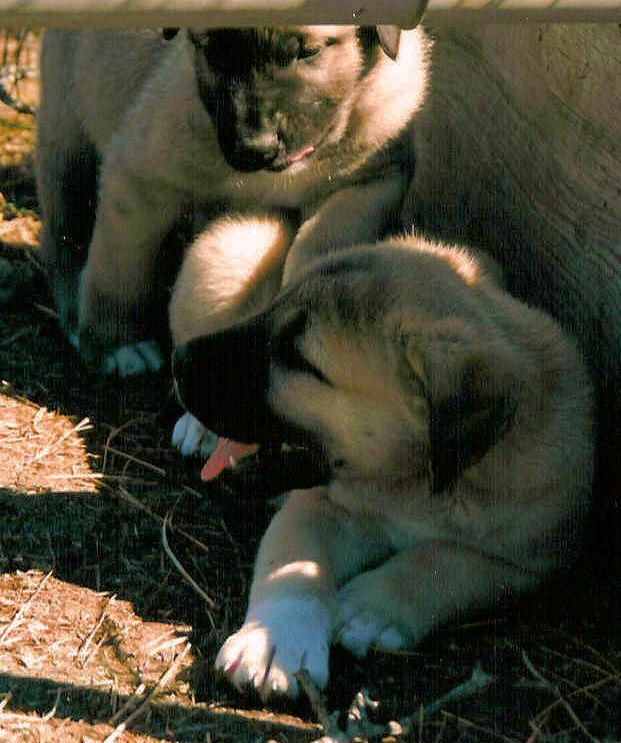 with her litter brother at about six weeks! 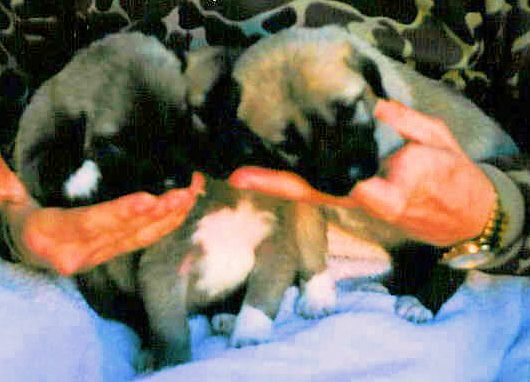 with the other two surviving pups in her litter at about four weeks!